Traditionally, the bright t-shirts with colorful logos and statements sold in retail stores and handed out by companies as promotional items are made using screen printing techniques. Interestingly, screen printing techniques first appeared in China around 960 AD and Westerners began to develop the technique into mass production in the 1930s. While screen printing continues to be a popular method of image transfer, digital textile printing is emerging as a popular option with lower costs and faster results than screen printing. Achieved by imposing a design onto a fine screen and then pressing ink into the screen over the desired apparel item, screen printing has been the primary textile printing technique for years. During screen printing, different images and colors each require a new screen or transfer sheet, requiring several steps to obtain the desired effect. Screen printing is also a common print method for designs on everything from balloons to clock faces as well as t-shirts and other garments and textiles. While screen printing continues to be an effective and common form of textile printing, digital textile printing is gaining ground. First seen in the late 1980s, digital textile printing uses an ink jet printer to create the desired design directly onto the item in a method called Direct to Garment (DTG). DTG printing tends to be faster and more accurate than screen printing techniques. Unlike screen printing, where the image may lose some sharpness or clarity, digital printing allows for a high resolution image with cleaner edges. Producing a product with bright, clear and sharp images is an important element to creating a quality item for businesses. Screen printing has a number of steps in the process that may take longer to go from digital art to garment print, and that is why some might prefer digital. Digital printing is a much faster process with fewer steps and can therefore return finished products to customers at a higher rate. As digital printing performs directly onto the garment, it allows for the avoidance of screen printing consumables - therefore producing less waste and energy. 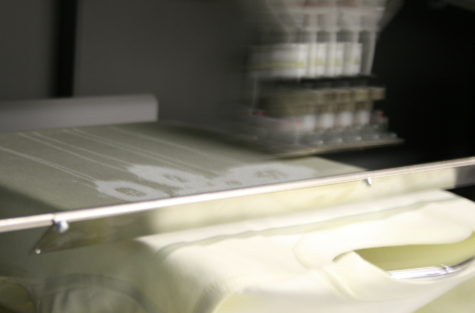 Many textile printers require a large batch for screen printing due to the associated cost and effort to create the desired item. Smaller batches are possible through DTG printing techniques, which offer a less expensive option for many companies and individuals. Moreover, note that the garment should be washed before wearing to remove any residual discoloration around the image from the printing process. In addition, always wash digital print items inside out to protect the image. When deciding between screen printing and digital textile printing, ask about the different prices and the possibilities of different images and designs. While screen printing may remain the right choice for that particular order, digital printing is becoming the answer much more often when it comes to quality, cost and turnaround time.